What is a Power Inverter for a Car? How Do You Convert AC to DC? How Long Can You Run an Inverter on a Car Battery? How Long Does a Power Inverter Last? Can I Use a Car Battery for the Inverter? Do Car Inverters Drain Battery? How Many Amps Does a Power Inverter Draw? While nobody likes to have huge machines occupying unnecessary space for the sake of providing electricity, it is important to always have a backup in case you do not have access to a power source nearby. This is where best power inverter comes to your rescue. A power inverter converts a direct current (DC) to alternating current (AC). You can use this power for any electrical purpose. However, not all power inverters are reliable. The best power inverter is one that lets you use up to 1000 watts, is portable, reliable and easy to use. So, if you are headed out to buy one, take a moment to read my in-depth reviews. I have spent hours on research to select top 10 products to narrow down the options for you. Maybe I can help you find the best power inverter at the best price. Let’s take a look at the Wagan Tech Power Inverter, 1,500 watts with three AC receptacles. This heavy duty inverter can give you 1,500 watts of continuous power. That’s enough to run most household appliances, and also great for road trips, on the job site quick applications, and for convenience in emergency situations while camping. When comparing this to other power inverters on our website, this one’s going to be one of the most heavy duty. This one does require a little bit more install, as you have to hook it up to the battery directly. If you want to store it inside the vehicle, it can be more difficult to run the wires from your inside to the outside. The other inverters typically plug in through your power outlet, so they’re just plug and play. But, if you need that extra juice, this is the way to go. It has three power receptacles, two USB ports , and an on/off switch. It comes with one three-foot power cable, and one three-foot ground cable. There’s ring eyelets at each end of the cable that can be connected to your battery and the other end securely connected to your inverter. To take it out of your truck when you need it, just link the positive cable to the positive on your battery. This can be noted by red coloring and a plus symbol. Connect your negative to the negative cable on your battery, and this can be noted by a black cable, and the minus symbol. Then, connect the black to the negative on your inverter, and the red to the positive on your inverter. It has built in safety features, such as auto-reset, short circuit protection, overload protection, low battery alarm and shutdown, and a cooling fan. The two USB ports put out five volts and share a three amp output. If you got out your Inverter mounted inside your vehicle, this is ideal for long road trips. This way, you got kids in the back, they can plug in their Xbox, laptops. It’s also great for business trips. Here, we got our laptop plugged in, and it’s powered directly off of our inverter here. If you need to use your laptop, or you need to charge it up on a long road trip, this is perfect for those traveling businessmen. You’re ready to go at any time. With it’s three outlets, you can use multiple devices and push your vehicle’s utility to the limits. Now, if you’re mounting your inverter inside your vehicle permanently, it is a good idea to have your cable hooked to a circuit breaker or fuse, just in case of emergencies, if there’s a collision or the wire would short out, it wouldn’t cause any welding to the vehicle, or potentially a fire hazard. This will ensure that you’re properly protected. This Wagan inverter can be hooked up to the battery directly. It’s powerful enough to run most household appliances, and also great for road trips, on the job site quick applications, and for convenience in emergency situations while camping. Having a gadget with no remote control seems impossible in the recent times. For this very same reason, this peak power inverter comes with a remote on and off switch. This is accompanied with LED indicators for fault and power. This inverter is specifically design to run heavy-duty electronic machines including refrigerators and chainsaws. To have a short circuit happen when a person is near the inverter is a dangerous thought. Therefore, the makers have provided protection against short circuits, fluctuations in voltage and over temperatures. The inverter comes with battery connection cables for ease of use. Unlike other machines, it boots perfectly without making loud noises due to its soft-start technology. When the battery is low, it will automatically shut down and without causing any harm to your inverter backed machines that are already running on it. Since it supplies 3000W of continuous power, you can run 4 devices at the same time for hours without any issue. It is an ideal buy for people who have solar powered houses or solar powered devices that they might want to run on an inverter. Though the makes have included adequate protection against short circuit, overload and high/low voltage, you shouldn’t exceed the max input voltage of 15.6 volts. Exceeding input voltage of 15.6 volts could cause severe damage to the inverter itself. One drawback that tags along with the inverter is that it has only one USB outlet. Therefore, your USB powered devices might have to wait a while before they are put to charge. This is a time taking process. The package includes battery connection cables. But what you need to really remember is that this machine is compatible with 12-volt battery systems only. Abstain from using a system with lower or higher volt than this. 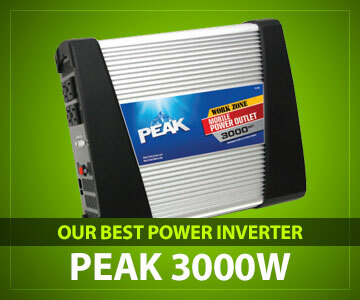 This Peak inverter is an ideal buy for long trips. It works great and can power heavy-duty devices with little effort. Even on long trips, you can easily connect anything that you want to run on battery and it will work just fine. However, it might sometimes itself turn on its fan to cool itself which becomes a little noisy. If you can deal with that, then this is surely the inverter you should go for. Are you looking for a small inverter that takes very little space but provides ample power for you to run power tools on it? If your answer is yes, then KRIEGER is what you need. This inverter converts 12 volts of direct current to 120 volts of AC current. You simply need to connect your battery cables to the battery of your vehicles and the power is in your hands. It is always reassuring to know that someone has your back in times of struggles. This inverter has all the protection you will ever need. The LCD display on the inverter keeps you informed regarding any kind of overload, temperature, input and output volts and the level of the battery. This way, you know beforehand if anything wrong is about to happen. It even displays details regarding short circuit. Approved by the METLAB, the inverter assures top security and safety for its users. Although the inverter is marked at 1500 watts, it provides a peak power up to 2200 watts. The best thing about this inverter is that it comes in a very small size and can power small appliances as well as power tools. With an automatic power supply, it can easily run vacuum cleaners, blenders, and other similar power tools, hassle-free. If you need power for a long time for a party or any other occasion, you can simply plug it into your car battery. You will be able to start your car even while it is connected to the inverter. One thing that I think could have been done better is its remote control. The remote control that comes with the inverter is wired which contradicts the entire meaning of remote control. It is ideal for users who prefer small electrical appliances to huge ones. Even though it has a petite build, it can power solar units up to a limit. With quality and compactness fused into one unit, the inverter keeps you informed regarding its functioning and safety and battery needs through its display. However, the entire notion of remote control is wrongly explained through its wired remote control. But if you can deal with the remote controls being wired, then there is nothing to stop you from buying this inverter. 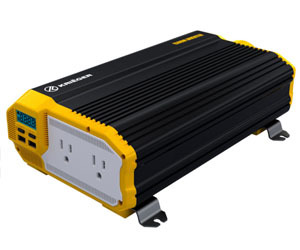 This BESTEK power inverter provides up to 300 Watts of continuous power and 700 Watts of instantaneous power to keep four to five devices running at the same time. And with a starting Wattage of 1000, you can safely run any electronic equipment that requires low operational wattage but high starting wattage. This is not something you’ll get with a regular inverter at this price range. What I loved about the inverter was its dual 110V outlets. I could easily charge my laptop and camera together. It only made things faster and I didn’t need to wait for hours for my gadgets to get charged. You can also plug in your television, game console or even just a fan in these household outlets. The inverter is intelligent enough to detect what kind of device you’re charging to boost the charging speed accordingly. It has 4 USB charging ports that make it perfect for simultaneously charging your phones or other USB-powered devices. Two of these ports are 2.1, one is 1A and another one is “Auto”. Although 4 ports are supposed to work at the same time, I’d suggest you to stick to 3 devices. One more piece de resistance of the device is that it doesn’t have to be powered up for the USB ports to work. For safety reasons, the company has provided built-in fuses that can be easily replaced and a cooling fan that prevents the inverter from heating up too quickly. It also provides protection from short circuits. The only qualm I have about the cooling fan is that it doesn’t operate silently, despite being branded as a “silent cooling fan”. If you are going to power up your inverter by plugging it into cigarette lighter port, do keep note of the power requirements of your electronic gadgets, even though the 26” plug is well-proof against overload and short circuit protection. Coming to the build quality, the inverter is solid yet lightweight enough to be carried during road trips. However, I was disappointed with its after services. I did not get consistent responses when I tried to get in touch with them regarding the product. They are very reluctant with their after-sales services. So, if you are someone who needs to call the company numerous times before they can finally get on with the product, then you might want to look further. This power inverter is ideal for people who always have something or the other plugged into their power sockets. It can carry multiple loads at the same time without any heating issues. If portability is also a major concern for you, you will be quite pleased with the closely-packaged design of the inverter. If you can get past the poor customer service, the product is quite a value for money deal. Here comes another handy inverter that you can carry along with you wherever you go. A compact build, easy accessibility and multiple safety options are what this BESTEK power inverter is all about. It provides 300 watts of continuous power and 2 AC outlets that enable quick charging. 2 USB ports are also provided to power USB devices. With the help of a cigarette lighter plug, it can be plugged into any car. However, you have to make sure to keep the car running to use the inverter. It is mainly because the cooling fan will remain switched on all the time. Another thing you should know about this product is that it is a modified sine wave inverter. Therefore, you should refrain from running devices that use an AC adaptor, e.g, refrigerator and compressors on this. Some people have a misconception that modified sine wave inverters damage electronics. I have learnt a great deal about inverters so far in my life. I can assure you that it’s just a myth. Only devices that use AC adaptors and certain types of medical equipment like CPAP, oxygen concentrators should not be connected to inverts like this. Besides this, even though it ensures the basic protection like any other power inverter, its unique multi protection system protects your devices when charging as well. A built-in fuse safeguards the device throughout and prevents overheating, short circuits or any problems arising from overloading and overcharging. Like the previous BESTEK inverter in this list, the USB ports of this unit also remains switched on even when the inverter is off. However, this also means that you can’t keep the devices plugged in as long you want, as it will drain the battery. Because it is a car inverter, the makers have armed it with all kinds of protection from drops and bumps while on road. The cooling fan comes really handy and reduces the heat of the inverter. However, one drawback that comes along with the inverter is that the same cooling fan makes a lot of noise when working. This BESTEK inverter is specifically designed for cars and is ideal for long trips and vacations. The inverter does not need to be turned on every time you want to use it. You simply need to plug in the device that you want to charge and you are good to go. On the downside, the fan remains switched on all the time and produces an annoying grunting noise. So, this is one issue that you might need to adjust with. Otherwise, the power inverter packs quite a punch to last you through your long road trips and hours of power cut. Before we start with the features, let me tell you that you won’t have to face any noisy cooling fan situations with ENERGIZER, unlike the previous inverter. The inverter is backed by an ultra silent thermal fan that hardly makes any noise when in use. I highly appreciate the fact that the inverter can be permanently installed as it has a built-in mounting post. It is one of the very few inverters to provide 9.6A charging capacity for a USB port. And what’s more, it has 4 such USB ports. However, I have noticed that the charging speed reduces significantly when more than 3 items are connected. Although its capacity is up to 500 watts, yet it provides a peak power up to 1000 watt. All the protection that you might need from an inverter is already here. So, you will no more need to worry about short circuits, overloads or temperature fluctuations. It quickly charges your gadgets and works just fine with any car that it is plugged in to. However, it could have done better with sturdier connectors. These connectors keep getting tangled which is very frustrating. But you can solve this issue by buying sturdier connectors yourself. There are times when you are so badly in need of a power inverter but don’t want to spend hundreds of bucks on it. This is one such inverter that you can invest in without thinking twice. It is best suited for people who love traveling. Due to its ultra silent fan, you won’t even realize its presence while taking a nap in your RV. This particular inverter is best suited for people who will use it for running small-scale domestic purposes. It has a tougher build compared to the other inverters in this segment. It provides 1000 watts of continuous power and a peak power up till 2000 watts. With 2 Alternating current outlets, two appliances can simultaneously be plugged in. You will also get a 2.1A USB charging ports for USB powered devices like smartphones and MP3 players. If you are having trouble running devices like microwave on it, maybe the wiring isn’t done properly. A major plus of the product is the direct cables included in the package. Using this, you can easily take power from the vehicle battery. Just connect two positive and two negative cables directly to the battery and you are all set to get started. In case of short circuits or low or overvoltage shutdown, the inverter provides optimum safety. Its pentagon protection also shields the machine against the thermal shutdown and has a low voltage alarm. Its digital screen keeps the user updated regarding battery life and voltage. I’d advise you to go for a deep cell battery to ensure optimal stability and performance. Another minor but significant feature I want to highlight is that the meter tells lets you monitor the load. This is a perfect match for a person who wants all the household facilities in his car or RV. However, the wires that came along with it did not work properly for me. So, I had to get these changed. But it works fine once I replaced the wires. This inverter is ideal for cross-country travelers or people who are mostly on road. They will definitely need to carry a lot of electronic appliances along with them. This Cobra inverter provides ample wattage of power to last you for a considerable period of time on the road. The wires might sometimes turn out to be faulty. Thus, check them before putting the inverter permanently to use. Besides this, all the features are pretty much up to the mark. Unlike most other inverters, this Foval inverter can be used for charging almost all electronic devices. It is a modified sine wave inverter, best suited for powering up household electronic devices like TV, fan, laptops as well for car repair works. Moreover, it has two USB ports and 2 AC sockets. So, you can charge various appliances simultaneously. It has a built-in fuse that ensures optimum protection. So, you need not be worried in cases of overheating, overcharging or overloads. I was impressed by the size of the product when I first saw it. It is my go-to inverter whenever I am out for a relaxing road trip on my RV. With a long cigarette lighter cable, the inverter can be extended till the back seat of your vehicle. It has been neatly housed in a durable metal casing. This protects it from bumps and drops on the road. Another impressive feature is its cooling fan that, besides reducing heat, also keeps the inverter silent while cooling it. You can charge your laptop, kindle, game console or any other device on this inverter. On a camping trip, the inverter will come handy in running the air mattress pump. Do keep in mind that you will have to keep the vehicle on if you want consistent power supply. What disappointed me about the inverter was that instead of providing numerous useful features, the inverter can provide a maximum power up to only 300 watts. In an otherwise near perfect device, a limitation like this is heartbreaking. An ideal inverter for frequent travelers, Foval has all the features that are required by oner. You can plug in two gadgets at the same time to increase the speed at which your work gets done. However, it can provide a power only up to 300 watts. This came as a drawback for me as I needed my inverter to be more capable than that for my automobile repair projects. However, if your maximum utility does not increase beyond 300 watts, you can definitely consider investing in this power inverter. If you are looking for an inverter that is economical yet also loaded with all the essential features, your search might just end here. First things first, assembling the inverter was a breeze for me. The structure is compact enough to be carried during outdoor trips. If your RV or house has a solar system panel, you can simply connect the inverter to it using the 4 mm banana jack inputs. It features a powerful charging capacity with two AC and USB outlets each. One very impressive feature that it has is that both the USB ports have a built-in smart chip. This chip helps it to recognize the device that is attached to it. This way it can provide maximum power depending on the device. During long rides, I can simultaneously charge my Macbook, binge watch GoT while my partner charges his phone. That way, we don’t end up fighting for the car charger. It has a considerably long cable that goes with all vehicles. It protects you from short circuits, overheating, overloading and overcharging. It is well fitted in a durable metal casing. This protects it from bumps on the road. I just wish that there was an easier way to mount the inverter on a vehicle. Otherwise, I didn’t notice any major flaw in the machine so far. Even if it is not the best power inverter money can buy, it is certainly one of the best ones for travelers. You can optimize your devices using the built-in chip in the USB port. This gives it an edge over its competitors and provides an efficient charging facility. The bottom line is that it lets you charge your laptop, camera battery or any other small device while the car is running with no issue. What would you do if you are stuck in the middle of nowhere and your phone is running out of charge? Bravo Power inverter comes to your rescue right at this point. With 800 watts continuous power and dual USB port, you can charge your gadgets and electronic belongings anywhere. It also has two AC outlets. So, whether you got normal appliances or USB powered devices, you can easily charge them together by simply plugging them to the inverter. I have installed this as a backup inverter in my 18 wheeler and it fully charges my laptop within 2 hours while the vehicle is running. I can’t ask for more. One pro tip, you should connect it directly into the car’s battery to get 800W. Otherwise, it will go down to the 250-300W range. The good thing is that this inverter is that it comes with direct battery cables using which you can use power directly from the vehicle’s battery. Besides this, these cables are 3 feet long and thus ensure ease of usage. It also provides protection from thermal shutdowns and short circuits. However, it turns off if used for products consuming around 150 watts but works fine with ones that consume lesser power. But on the slightly negative side, I didn’t at all like the placement of the Red on and off switch. Other than that, the noisy operation also makes it hard to sleep in the car. This inverter is not meant for charging heavy-duty appliances like drilling machine or refrigerator. If you are in need of a simple and portable inverter for inflating air mattresses during camping or charging your camera battery when you’re off to the wild, this could be a decent purchase. Power Drive inverters provide 1000 watts of continuous power and a start up wattage of 2000 which is suitable for a wide array of electronic devices including sound systems, TV, microwave oven and electric skillet. If you need a power backup for carpentry jobs, you might be slightly disappointed. It cannot pull off enough amps to run a high-end chainsaw or circular saw. However, low-key power tools will work just fine on it. Like most other inverters in this segment, it also has two AC outlets. However, it has only one USB port which compels you to prioritize only one device for charging during long drives. But on the brighter side, you won’t have to keep the car running constantly when the inverter is in use. There’s an alarm which will buzz as soon as the battery is too low. I loved the heavy duty cables that can directly be attached to the battery of the vehicle. It’s a bumpy ride ahead and the makers had that in mind. Thus, it comes in a casing that protects it from bumps on the road. It also employs a built-in breaker that protects the machine from short circuits and overloading. This is an overall good product and a perfect fit for its price too. You don’t have to keep your vehicle running when you’re using the inverter. There’s a built-in alarm to notify you about the low battery status. It is also packed with premium safety features to prevent overloading and short circuit. However, it has only one USB port. But if that is not a big deal for you, then you should definitely go for this product. A power inverter takes up the power from a car’s battery and converts this direct current to alternating current. It does so because all the various appliances that run in a household run on alternating current. Large electronics also run on alternating current. Thus, a power inverter converts DC into AC and enables you to run all appliances hassle free. Because we cannot use normal electric appliances by directly plugging them into the socket of a car, we need a converter that can convert the car’s 12-volt direct current to 120-volt alternating current. The power inverter is what does the work of this converter. It can be used to run various electrical appliances by connecting the inverter to the car and the appliances to the inverter. Most of the electronics that we use at home require a pure sine wave, thus many inverters have added features that create pure sine waves. There are different types of inverters that are used to function in a car. The two main kinds from among them are modified sine wave and pure sine wave inverters. 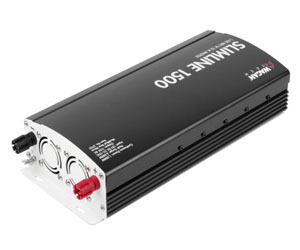 As the name suggests, modified sine wave inverters produce modified sine waves. This type of inverters tries to clone pure sine waves by making the voltage go straight up and down. These are mostly suitable for running simple household electronic items. For delicate medical equipment and upscale sound systems, you should opt for a pure sine wave inverter. On the other hand, pure sine waves produce sine waves that are closer to the alternating current produced at home. There are numerous gadgets that need a continuous power supply. In the absence of continuous power supply, these electronics cease to work properly. Thus, pure sine waves prevent this from happening. However pure sine waves are costlier than modified sine waves. LED TVs, audio systems, medical equipment work to their maximum efficiency on pure sine wave. The work of converting alternating current to direct current is done by a rectifier. The easiest way to convert AC to DC is to use diodes. Diodes are devices that allow current to pass easily from positive to negative terminals but not so easily from negative to positive terminals. Even though the bridge rectifier has converted the AC to DC, the resulting current is not a steady voltage. Due to too many ripples in this resulting direct current, the circuit can malfunction. Therefore, this resulting DC needs to be further filtered in order to make it steady. For this purpose, two kinds of rectifiers can be used- half-wave rectifiers and full wave rectifiers. The former uses only one diode. It is so called because it allows the passage of only half of the AC current. These are simple to construct. The latter, on the other hand, use two diodes. This allows the current to pass both the terminals. Due to this, the input AC voltage gets converted to twice in the form of DC voltage. How long your inverter can run on a car battery depends on two things- how much power you are using and what the capacity of your battery is. This formula will give you the length that your inverter can run on the car battery. As already mentioned, how long your power inverter lasts depends on how much load you are attaching to the inverter. If you use the entire wattage of the battery at once, then dividing the wattage of the load attached by the voltage of the battery will give tell you how long the inverter will last. Keep in mind that if you follow this method, the result that you get will be very less number of hours depending on the capacity of the battery. However, that is so only because here, our load voltage is equal to the battery capacity. Also, the actual run time of your battery will be a little less than the answer that you get because 100% efficiency is practically not possible. We can definitely use car batteries to power the inverter. However, car batteries are designed for light operations and needs to be kept full most of the time. Using a car battery for an inverter means draining it with a considerable amount. This is usually not suggested. Deep cycle batteries are a better choice as they guarantee longer life cycles. But you need to be aware of the fact that lead-acid batteries are not sealed, there are chances that the acid might spill. Whether car inverters drain the battery or not will depend on whether the engine is running. If the vehicle is being driven or the engine is kept running, then the inverter will not drain the battery. But if the engine is not running the battery will run down. So, it is better to stop using the inverter before shutting down the engine or always keep a deep cycle battery as a backup. To find out how much power an inverter draws you simply need to divide the load watts by 20. This will provide you with a number of amperes that a power inverter draws. Blessed are the creators of power inverters who provided us with instant relief systems during emergent situations. There are various brands that will provide you with various features. So, make a list of features that you will need in an inverter and then make your choice. 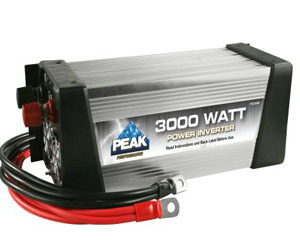 If I were to suggest an inverter, I would at once, go for PEAK 3000W. However, if you want to go for a smaller and easily portable inverter, then KRIËGER 1100-Watt is what you should pick. In the end, the best power inverter for you depends on your needs, so choose wisely and drop me a comment, if anything.